1. Does the Mediterranean diet protect against depression? We already know that a Mediterranean diet full of vegetables, fruits, nuts, legumes, fish, and olive oil reduces inflammation and may be beneficial for heart health. But eating a Mediterranean diet can also protect against and prevent depressive disorders. If you aren’t going to Spain or Greece anytime soon, pretend you’re there by copying their diets. Add more veggies to your potlucks, or shake on the herbs and spices to reduce inflammation. 2. Will eating fast food lead to an increased risk for depression? Eating fast food like hamburgers, sausages, and pizza, as well as commercial baked goods such as muffins, doughnuts, and croissants has been shown to be associated with an increased risk for depression. 3. Will being in a positive mood lead to eating more? 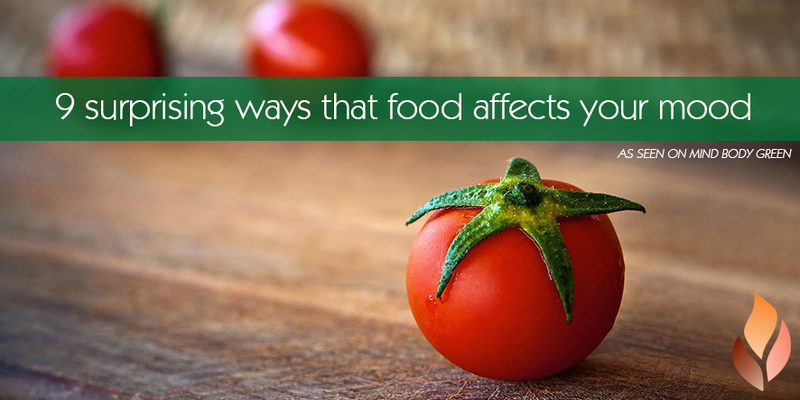 It’s not just a bad mood that can lead to eating more food. Negative mood and positive mood BOTH lead to more food intake. 4. Can you eat yourself into a bad mood in just two days? A study revealed that the more calories, saturated fat, and sodium people ate, the more negative mood they reported two days later. The researchers suggest that the food causes mood shifts. 5. Can snacks affect your well-being? Consumption of fruit is associated with lower anxiety, depression, and emotional distress than consumption of chips/chocolate. Similarly, scores for somatic symptoms, cognitive difficulties, and fatigue were greater with chips/chocolate consumption. 6. Can your emotions change how foods taste? A study came out recently that assessed taste and emotions of people who attended hockey games. There were a total of eight games: four wins, three losses, and one tie. The researchers found that positive emotions during the winning games correlated with enhanced sweet and diminished sour intensities while negative emotions lead to heightened sour and decreased sweet tastes. Take time to taste your food and have awareness that the emotions you are feeling are not only influencing what you are eating but how things taste. If you take your time to eat mindfully, you’ll be more in the moment, and, as the studies suggest, you’ll likely eat less and feel more satisfied. 7. Can being bored drive you to eat? Those prone to being bored and lacking emotional coping skills can lead to inappropriate eating behavior, like eating when bored or in response to negative emotions. Being bored is probably the least of your worries during the holidays; however, you may have more downtime which means that you could be looking for things to do. Fill your time with healthy physical activity to keep you pleasantly busy. 8. Does your personality drive your eating habits? High openness to experience was associated with higher fruit, vegetable, and salad and lower meat and soft drink consumption. High agreeableness was associated with low meat consumption. Conscientiousness promoted fruit consumption, prevented meat consumption and intake of sweet and savory foods and of sugar-sweetened soft drinks. Neuroticism promoted consumption of sweet and savory foods by promoting emotional and external eating. Perhaps we can’t change who we are, but we can become more aware of our actions. If you find that you are always on edge and feeling neurotic, try to put yourself in the space of agreeableness and openness, which will contribute positively to your eating habits. 9. Does being a “morning person” make you less apt to eat emotionally? If you like mornings more than evenings and you find yourself more alert in the early hours, you might have lower depressive symptoms and emotional eating. Make sure you’re getting sufficient sleep so you don’t crave foods. If possible, try to mirror your rhythm with that of nature: waking up early with the sun and going to bed early when it is dark. You’ll be more in balance on the inside through the cues on the outside!